Author of over a dozen of groundbreaking books ,including the popular Timeless Secrets of Health and Rejuvenation, Andreas Moritz has assisted people in taking responsibility for their own health and well-being. No rigorous workouts. No surgery. 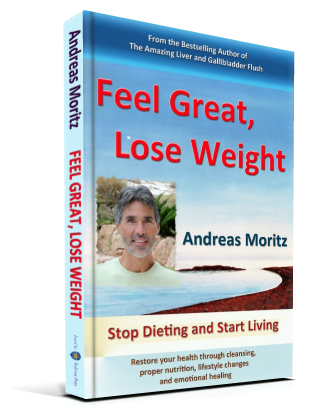 In this book, celebrated author Andreas Moritz suggests a gentle – and permanent – route to losing weight. In this ground-breaking book, he says that once we stop blaming our genes and take control of our own life, weight-loss is a natural consequence. “You need to make that critical mental shift. You need to experience the willingness to shed your physical and emotional baggage, not by counting calories but by embracing your mind, body and spirit. Once you start looking at yourself differently, 80 per cent of the work is done.” In Feel Great, Lose Weight, Andreas Moritz tells us why conventional weight-loss programs don’t work and how weight-loss ‘experts’ make sure we keep going back. He also tells us why food manufacturers, pharmaceutical companies and health regulators conspire to keep America toxically overweight. But we can refuse to buy into the Big Fat Lie. Choosing the mind-body approach triggers powerful biochemical changes that set us on a safe and irreversible path to losing weight, without resorting to crash diets, heavy workouts or dangerous surgical procedures. If you’ve done every diet, taken every pill and read every book, you’re probably wondering if there’s any point giving it one more shot. But you’ve possibly been seduced by conventional propaganda that places your health and weight in the hands of weight-loss experts, the gymnasium, medical doctors and the pharmaceutical industry. There’s a very definite payoff – for them – in getting vulnerable individuals to believe their self-serving promotional spiel. But what the universal weight-watcher’s guide won’t tell you is that losing weight – yes, a considerable amount of weight – is about healing. Despite the notion we’ve grown up with, that we cannot heal without prescriptions, pills and surgery, conventional wisdom says something else. In this book, we’ll discuss the natural way to losing weight – no pill popping, no crash or fad diets, no calorie counting or rigorous aerobic exercise. The human body is a wonderful precision machine that is constantly seeking a state of equilibrium or homeostasis. An overweight or obese body is a body in distress. But the human body is also amazingly resilient. So despite the abuse it has been subjected to, it is possible to reverse the processes that led to this state and rebalance the body’s biochemistry to achieve its normal, optimal weight. To know more about this book click here.